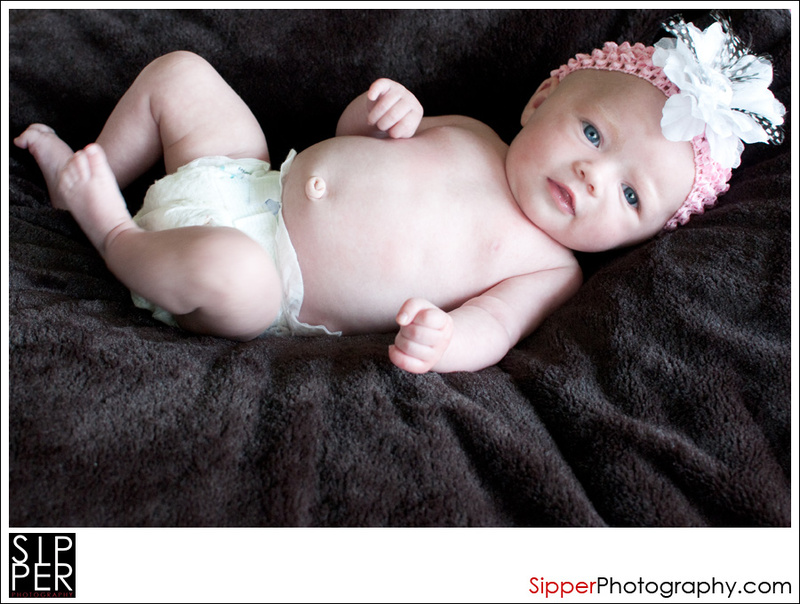 Happy Valentine’s Day from Sipper Photography! On this day I would like to reflect on my own LOVES. 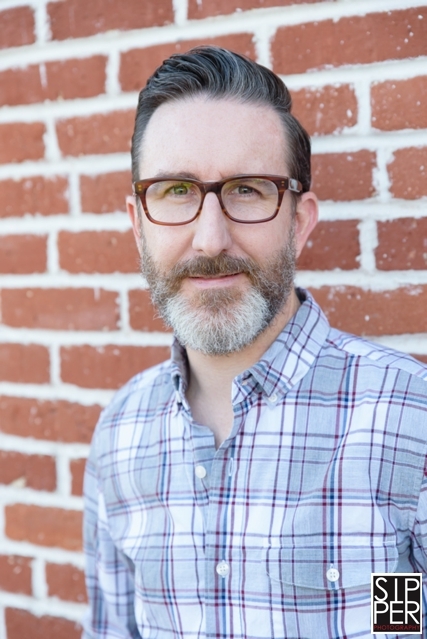 My husband, Jeff is the love of my life. We created a beautiful family together and now have our son, Hudson. I am so thankful to have this man in my life. Our passion for photography is never ending. Jeff and I have been working in the photography industry for 20 plus years now. 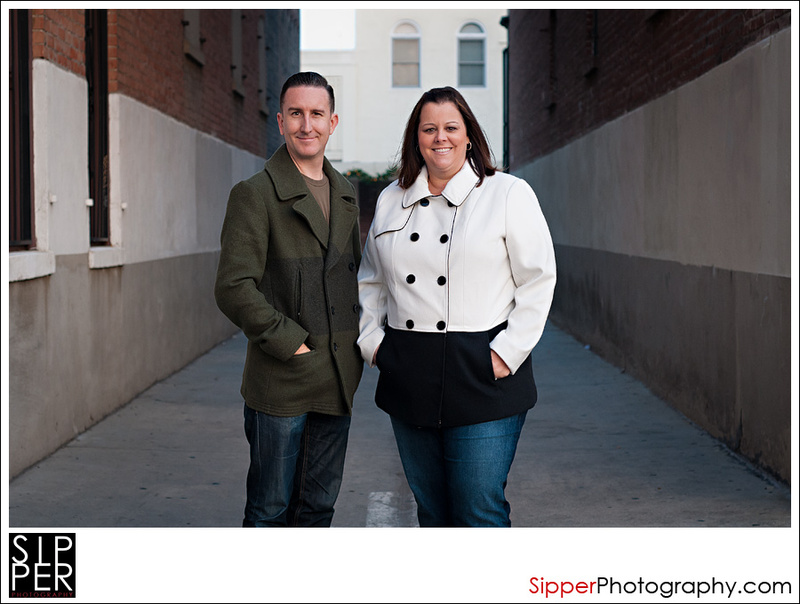 I love working with my husband and we are so proud of the business we created together at Sipper Photography. This week is a celebration of LOVE and I absolutely LOVE what I do as a photographer. Over the years, we have captured so many engagements, weddings, anniversaries and families in Orange County as well as all across the country. All of the LOVE we have documented makes me feel happy and blessed. We thank you all for letting us into your life to document your memories. Happy Valentine’s Day to you all… and to my husband, Jeff… I love you!!! The two of us, capture the two of you! If you are getting engaged this Valentine’s Day, we want to hear from you. We would love to shoot your engagement session and wedding photography! We are currently booking our 2018 weddings, so please inquire about your date. 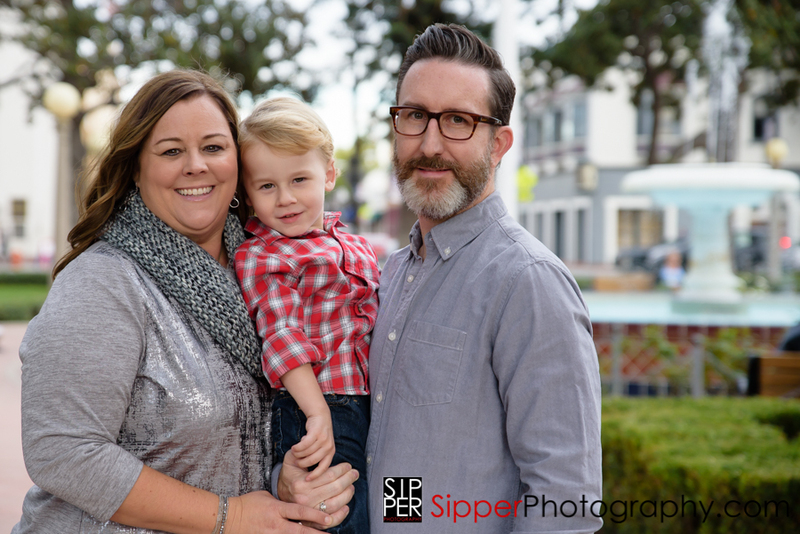 Surprise Proposal Photography, Engagement Portrait, Engagement Party, Bridal Shower, Rehearsal Dinner Event Photography, Boudoir Photography and Wedding Photography packages are all available. 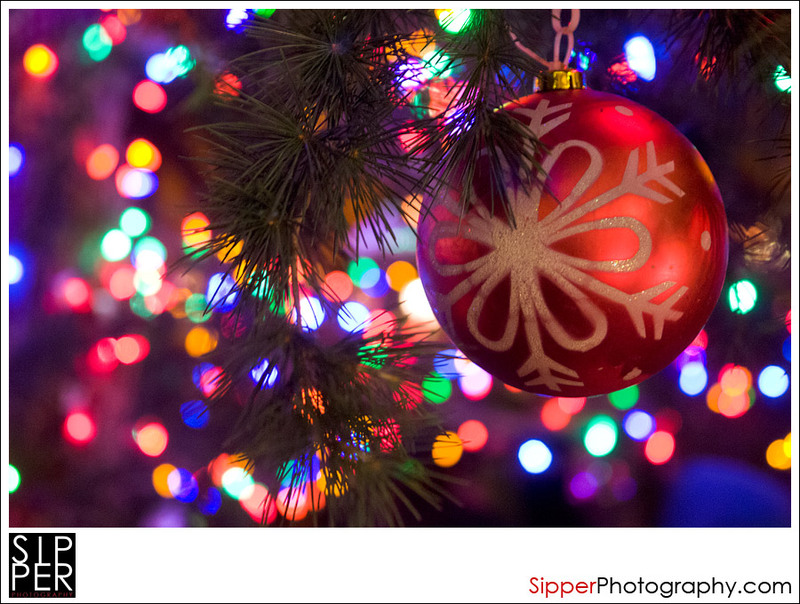 Happy Holidays from Sipper Photography! From our family to yours….We wish you a Very Merry Christmas!!! 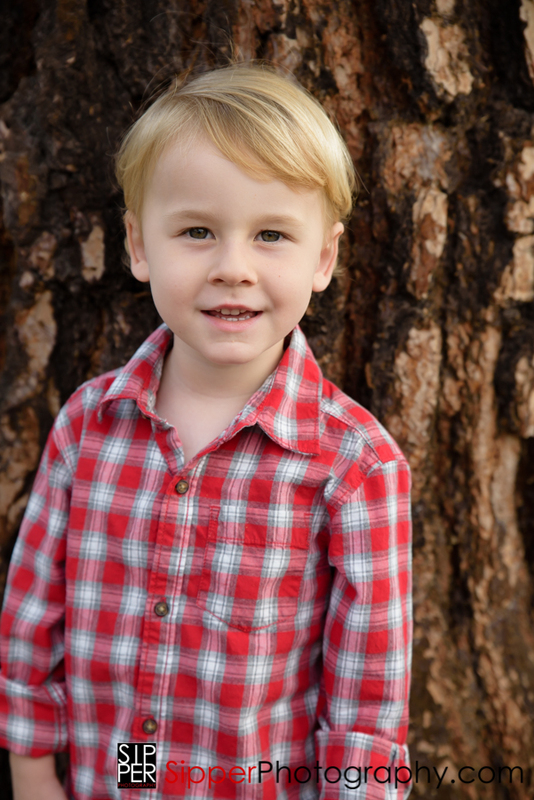 Our Son, Hudson at 3 1/2 years old! Be safe with your travels. Enjoy the time with your family and friends. Toast to the New Year that is ahead of us. Recently, I was invited to a VIP online shopping experience from a 2012 Fashion Collection and received this fabulous Steve Madden Pea Coat to review. Being professional photographers, I thought what better way to display this review then to have some photos of me actually wearing the coat. I always wanted a winter white coat and I immediately fell in love with this Ivory and Black Pea Coat. I loved the style and look! Though I am a plus size girl, I am always concerned with the fit and having something cute. For once, this was all 3… perfect fit, with a contemporary style and look! This is the perfect time of year to have this coat with the holidays approaching. I live in Southern California and although we don’t have extreme winter conditions, we do however have some crisp winter nights. 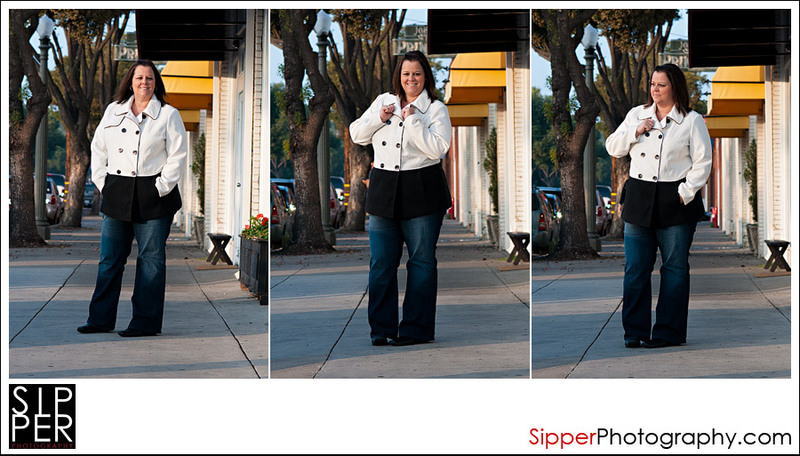 This mid weight coat is perfect for a chilly night on the town of dinner and shopping. 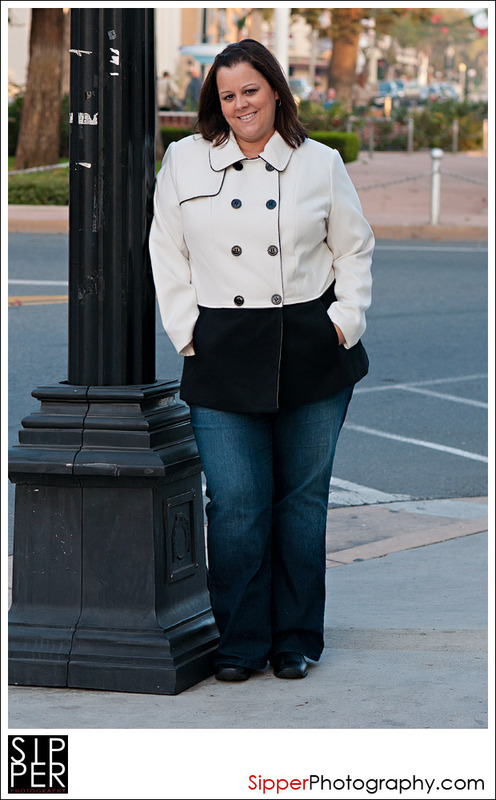 My husband and I took a stroll in Old Towne Orange one evening and I loved wearing the coat. It was very comfortable and fit perfectly as we walked around. Although, it has the look of a wool pea coat, it is actually made out of a polyester/rayon/spandex blend, so the best part is the coat isn’t scratchy!!! As you can see in the photographs, this pea coat fit is very flattering and has a great design. Thanks to GigaSavvy for the invitation to review this coat! I hope you can enjoy your very own Steve Madden Pea Coat too! *Disclaimer: Item was gifted by GigaSavvy for review. With this news we wanted a little creative way to share our pregnancy announcement. 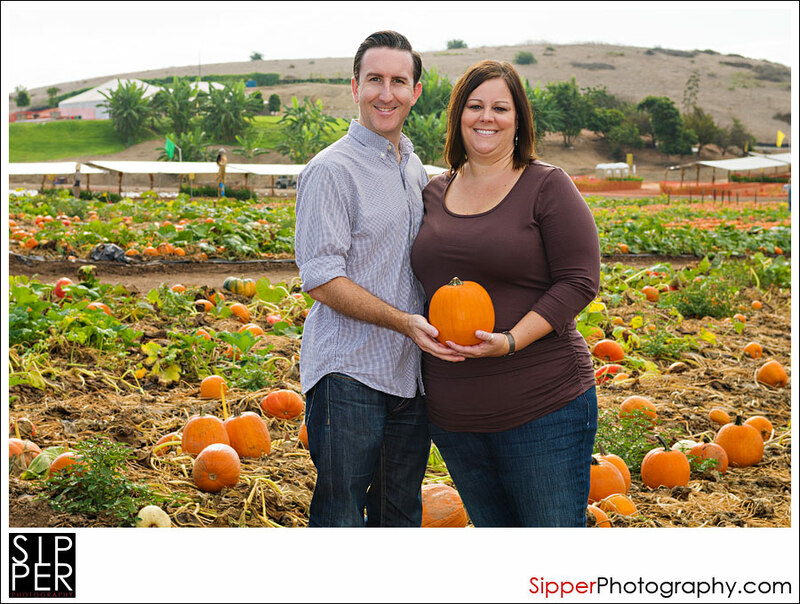 So, we headed over to Tanaka Farms Pumpkin Patch in Irvine and took our first family portrait today with our little pumpkin. Our little pumpkin is due March 26, 2013. We can’t wait for you to meet our little guy. Yes, you read that correctly. It’s a boy! For those of you who know us, you know that we LOVE New Orleans! Both Jeff and I have traveled to NOLA on several occasions as we just love that city. We were just there in October eating some jambalaya and drinking hurricanes, as well as exploring the French Quarter. This trip we also took a ride out to the beautiful Oak Alley Plantation and saw many other fabulous plantations along the way. These are such great locations for Weddings in and around the New Orleans area. One of the hot spots for weddings this past October was in Jackson Square and in the St. Louis Cathedral in the French Quarter. What a great back drop to say your I-do’s and do your wedding photography. Then there is nothing better than after the ceremony when the Treme Brass Band rolls up to start a second line for the couple as they dance and celebrate through the famous streets of the French Quarter including Bourbon Street! We actually joined a few second lines this time as we LOVE that New Orleans Jazz and of course LOVE anything weddings! With our love for New Orleans and Weddings, one of our goal’s for 2012 is to get there for more weddings this year! 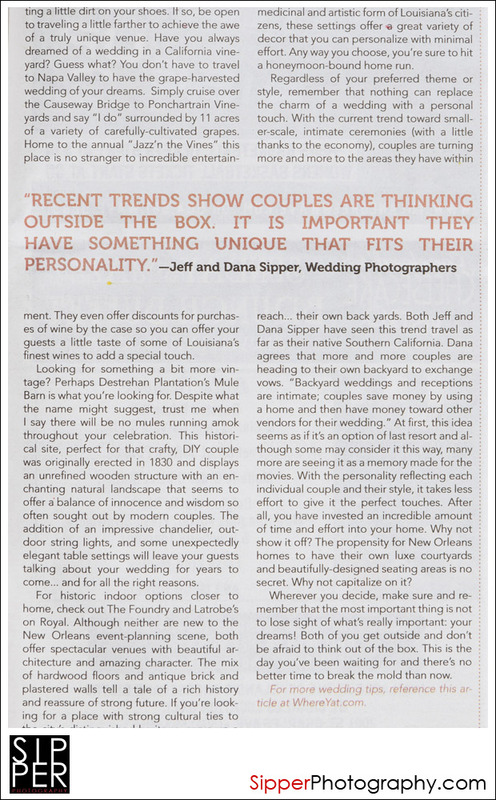 With this goal in mind we were so excited to have been quoted in a recent magazine article about New Orleans Weddings. Where Y’At Magazine is a local New Orleans publication that recently featured an article about wedding trends in their January 2012 issue. 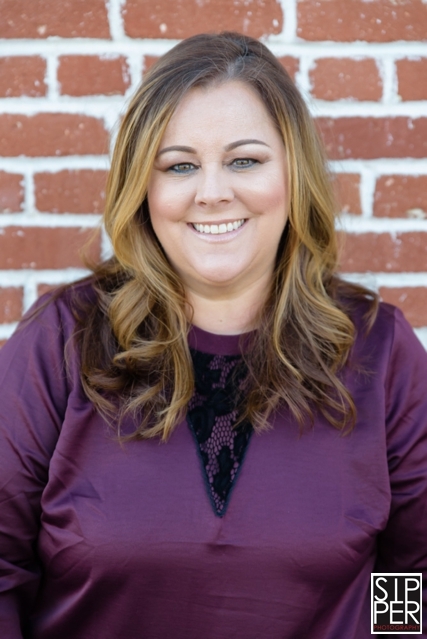 The local writer, Tyler Lott who is a New Orleans native reached out to us as she wanted our perspective from what we see with wedding trends in Southern California and how they coincide with the trends in New Orleans. 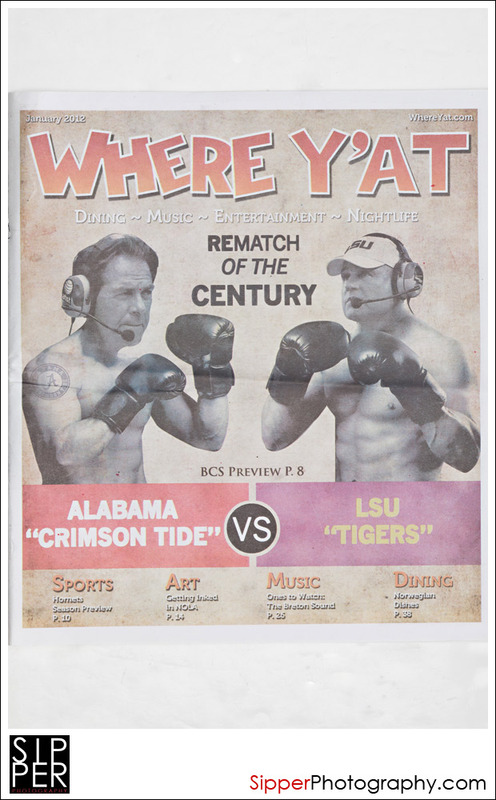 You can see the entire article online at Where Y’At magazine. 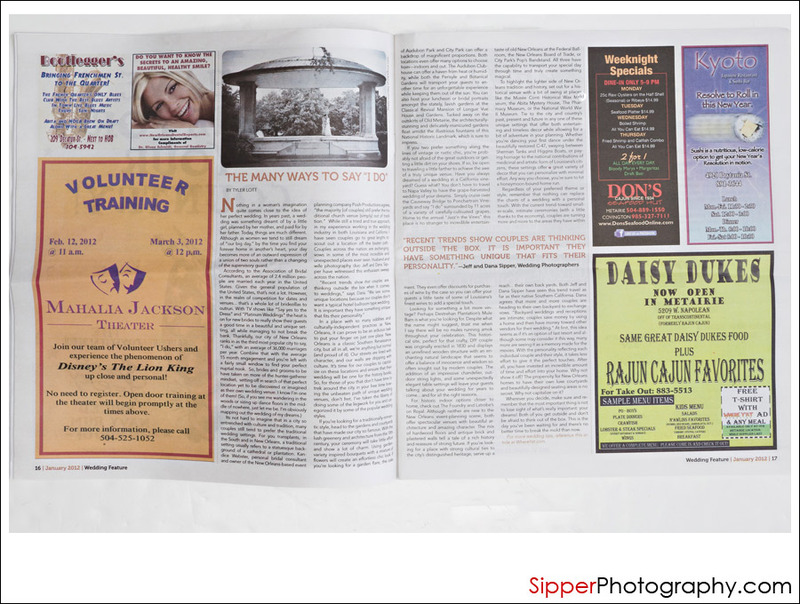 In the meantime, look here…it’s The Sipper’s and we are so excited to be a part of New Orleans Weddings too. So excited that our quote about wedding trends was chosen out of the article for the pull quote. 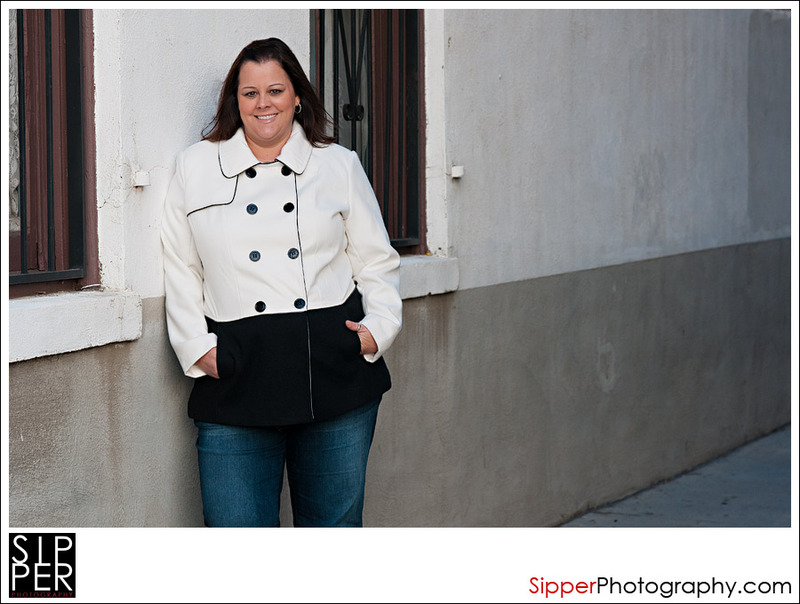 For further info on having Sipper Photography shoot your wedding in New Orleans, please visit our website. Today marks 10 years since the 9|11 tragedy. Over the past several days there have been documentaries on TV and memorial tributes to 9|11. We went to the Angels vs Yankees game on Friday evening and they rolled out the American Flag on the field as a tribute to America. There are so many stories from those on that day. I am sure many of you looked back and thought about where you were on that day the planes struck the World Trade Center towers. Most of us on the west coast woke up to the tragic news. Our alarm clock went off that morning to the news on the radio. We were in shock to hear the 1st tower had been struck and immediately stood up in bed and turned on the TV to see the news. We have taken a moment to remember that day, it was tragic. I teared up today as I watched the coverage in New York City as they launched the Memorial Fountains at Ground Zero. Many lives were lost and peoples lives were changed forever. It is hard to believe that someone would want to cause so much pain to a country and its people. We will never forget what happened on September 11, 2001 but we will live our lives and hopefully cherish each day that we are given. I know I do. I can’t even imagine being near those buildings when they collapsed. I can relate though to the loss of a loved one. Though time goes by, we live on but never forget them. It is hard to understand why things happen, but we must stand together and be thankful for each day we are given. Most of you know how much Jeff and I love to travel! Recently, we had a brief visit to New York City. Today I wanted to share some shots from our trip to New York City this summer as a tribute to the city. Though the city suffered at one time, it is still a beautiful place. We only drove by Ground Zero as it was and still is under construction with glass boundaries at every corner, but explored many other places in Manhattan. To all of those that lost their lives September 11, 2001 we remember you! Thank you to all of those who served on that day and since then. We will never forget what you did for us. View of the city looking up through the sun roof in our car! Another view of New York City and its skyscrapers. This shot was taken from the 86th floor of the Empire State Building. In the distance to the right you can see the Statue of Liberty. Just to the left of the Hudson from there you can see the construction of the new tower at Ground Zero. Hey everyone! Recently, we were contacted by the good people at Ties.com and were asked if we would like to check out a couple of their ties in exchange for blogging a bit about them. In the past few years, as the wedding business has picked up for us, I’ve needed to step up my game as far my clothing, etc. Dana and I end up at a lot of wedding industry mixers and other networking events where if you are not dressed up some, you look a bit out of place. Having worked in the surf industry the past 12 years or so, I’ve been pretty accustomed to wearing shorts and T-shirts most days. This doesn’t really fly when you are trying to impress potential clients. The best part about Ties.com is that the ties are very affordable, they have a ton of different styles and the quality is great. 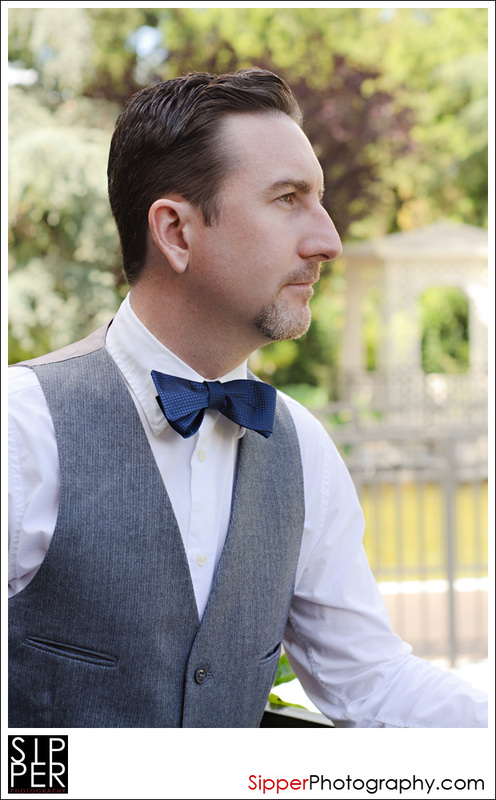 I decided to check out a bow tie, since I’ve never really worn one, other than at my High School Prom. And that was a pre-tied style. I have to say, after searching various websites and YouTube for about an hour, I finally found a video that taught me how to tie it. It wasn’t as easy, or as hard as I thought it would be. Just takes some practice to get it right! Keep on the look out for another post down the line featuring the other tie they sent me! 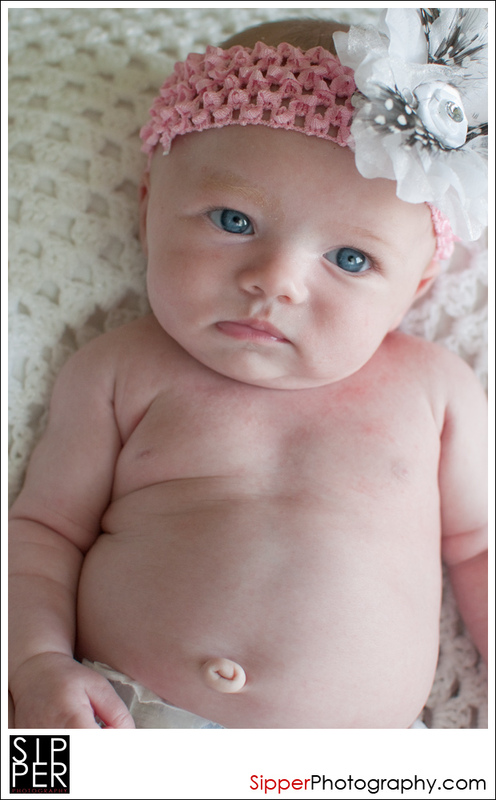 We just want to welcome our new niece Kelsey into our family. 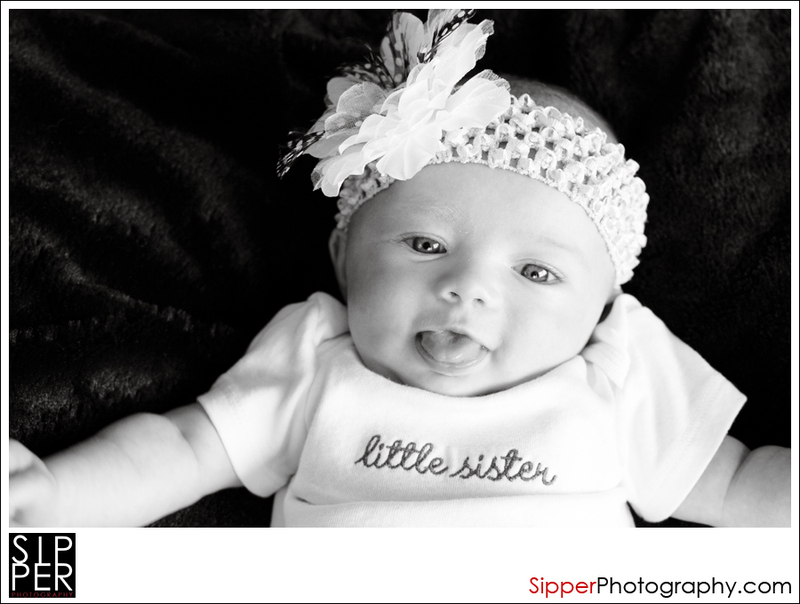 Being featured on the Sipper Photography blog makes it official Kelsey, we are so happy you are here!!! Haha!! 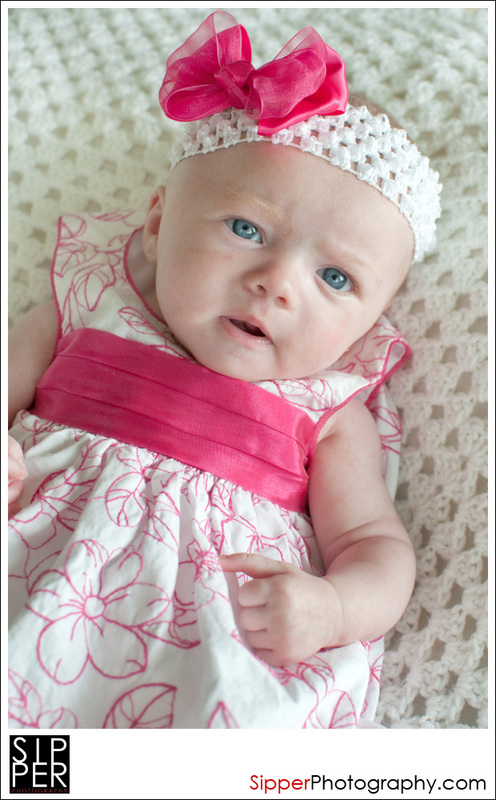 All kidding aside a big congratulations to Jenn and Andy on having another beautiful baby girl. 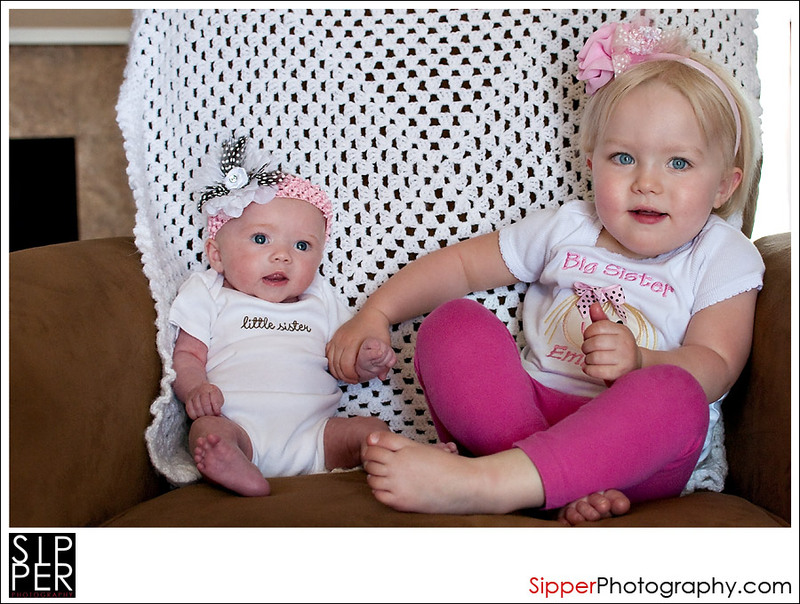 Miss Emmi is going to be a great big sister, we love them both dearly. Ok, Jenn and Andy…we love ya too! 🙂 Anyways, here is Kelsey’s first official shoot for her birth announcements. Since Aunt Dana is the paparazzi with her camera. I am sure this will only be the first of many photos over the years, so get ready! Smiling at me. She loves her Aunt Dana already! Love you both so much!!!!! !